Lovely Chocolate Stand, bonbon dish, candy plate. Vintage Delft ceramic blue white relish server. Yesteryear serving tray housewarming gift. 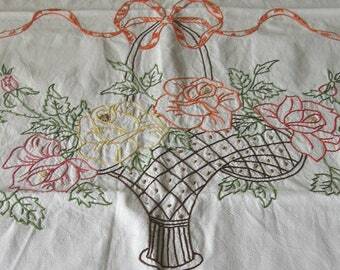 French Fruit Basket, country home kitchen table center piece. Vintage pretty roses wedding gift. Announcement We're celebrating Easter, Spring and Mothers Day this year by offering a sale on all things pretty, floral and feminine. Easter is 21st April, Mothers Day (USA+) is 12th May. We offer free shipping on the majority of our items, but where it is not available we will combine shipping costs of any multiple purchases and refund the difference. All items are sent tracked. See our FAQs at the bottom of the page for shipping times. If there is something you like but you think the price is a tad high, make us an offer. We like a good, friendly haggle. Who are Pumpjack & Piddlewick? Our life is about wine, animals, weird tools and anything French, all of which act as inspiration for many of the vintage, antique and artisan items you will find in our shop. Pumpjack works the vines and makes amazing wines, whilst Piddlewick details life in France in our blog. We lead a homesteading and healthy lifestyle and work surrounded by 8 pet ducks, including our Maggie, 3 cats, and a standard sized dachshund whilst restoring our house and garden. It can get delightfully busy. We welcome you to browse, ask questions, and of course, we hope you will buy one of our unique items. We're celebrating Easter, Spring and Mothers Day this year by offering a sale on all things pretty, floral and feminine. Easter is 21st April, Mothers Day (USA+) is 12th May. Ladies Safety Razor with original box from the Depression era. Truly rare women's shaving toiletry, compact, travel sized. Truly retro Sunglasses, 1960s Viennaline vintage fashion. Optyl golden round acetate frames with tinted lenses. Lovely bygone days painting of woman reading a letter. French vintage hand lithograph quality reproduction. 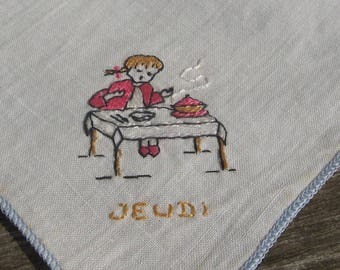 Children's Chores Handkerchief Set, beautifully hand embroidered. French days of the week: Monday, Tuesday, Wednesday, Thursday. Oak Barrel Makers Tool, antique coopers crowbar fits end caps on barrels. Truly unique wine lover / maker gift. 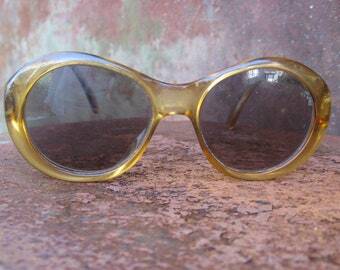 French Clip-on Sunglasses, mid century retro gold browline frames. Unique vintage look for him or her. 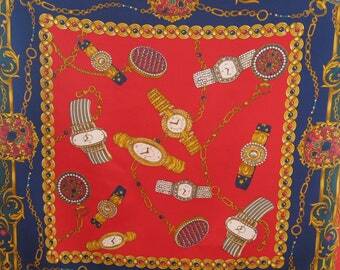 Gorgeous Bling Bling Scarf in satin, of gold and jeweled wrist watches. French vintage rich jewellery headscarf in bold colors. Authentic French Wine Tasting Cup, multi faceted for viewing wine color. Classic wine lover gift from France. Depression Era Tortoiseshell Eyeglasses, in great Gatsby style. Lucite, vintage reading glasses for woman or child. Elegant Umbrella of varied hues from bronze to cream. Vintage sun parasol, with twisted gold metal curved detachable handle. French Aperitif (Apero) Dishes for hors d'ouevres, apetizers and tapas. Serving plates for cocktail happy hour parties. Earth Tones Striped Reto Umbrella, French beach sun parasol in lovely artistic terracotta design. Boho festival rain accessory. Oriental style box of burgundy laquer and gold birds on flowering branches. Unique French storage container, good size for jewellery. French knife sharpener, mid century vintage butchers blade sharpening tool. Chefs essential kitchen carving utensil. Classic French Wine Tasting Cup, multi faceted for viewing wine color. Unique gift for a wine lover, from France. Stained Glass Window Scarf of Churches on hillsides in rich beautiful colors. Bold religious modern art fashion. 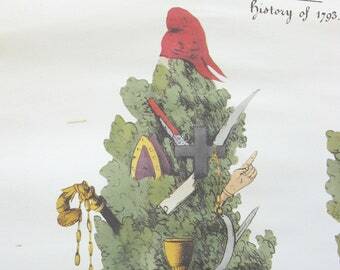 French Satirical Poster for the 1793 Revolution Reign of Terror. A unique militaria collectors wall hanging gift. 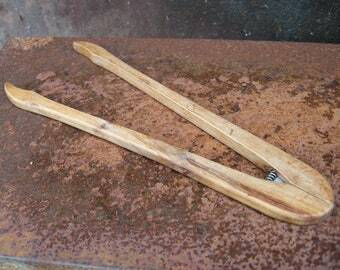 Large French wooden Toast Tongs, or pickle, gherkin, cornichon pincers, salad servers, even as hand washing laundry tool. Romantic riding style Hat with lace ribbon, fancy and hatpin. 80s Kathy Jeane traditional millinery. Cute Duck Lover Gift Set of Vanity Tray and Scarf. 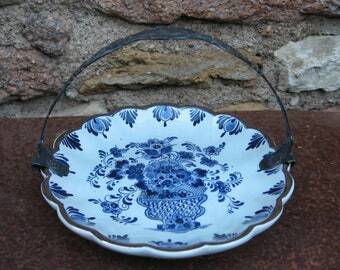 French jewelry dish and Ted Lapidus neckerchief. 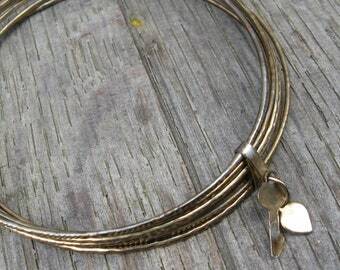 Boho Bangle Bracelet with heart and key, unique love message piece. Lovers jewellery gift for girlfriend, wife or mother. French square head nails, mid century village forged farrier horseshoe fasteners. Set of 10 rusted farmhouse stable barn accessories. Victorian Coach Scarf, vintage equestrian style fashion by Gim Renoir, French designer. Horses, horse shoe, stirrups, saddle design. 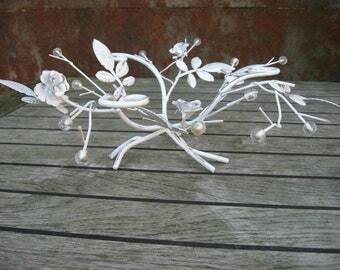 Gorgeous Easter Basket of distressed white metal, French vintage multi use container. Pretty country farmhouse decor or garden planter. Carp Lusterware Bowls, 2 French iridescent ceramic fish for salt & pepper or seasonings. Beach house condiments. Fishermans desk organiser. This item was beautiful and artfully packaged. I look forward to working with PumpjackPiddlewick in the future!!! RESERVED for Catherine. Tiny French Porcelain Pill Box. Miniature white ceramic container with metal hinged lid. Cute hand painted flowers. French Street Scenes Scarf. Vintage scenes of Paris shawl. Abstract design neckerchief. Bold statement cotton neck wrap. Francophile gift. I am in love with all the stamps on this tankard. 1800s French Measuring Cup, Demilitre heavy Pewter Tankard or Pitcher. 19th century old spirit measure, hallmarks. Good unusual beer stein. Our October 50% OFF SALE is themed around the colour black. Longer nights, cooler temperatures (at least where we live) and Halloween finishing the month all play into our theme. We hope you'll have a browse of our sale. I am so so in love with this mid century artwork. It's so atomic age! Physics book for children. 1961 vintage rare Whitman Learn About book. Retro 1960s drawings. Junk journal scrapbook science fun ephemera. We're Pumpjack & Piddlewick, a creative redhead and an eccentric Oenologist Negociant (fancy terms for wine maker). We are pursuing our dream of making our own wine in France. We lead a homesteading, waste-not-want-not lifestyle in conjunction with ducks, cats and a standard sized Dachshund. It can get wondrously busy. We love and live all things vintage, from an amazing corkscrew to a quirky French cheese platter. We particularly appreciate the time and effort that went in to a beautifully hand embroidered linen to the craftsmanship of well made wooden furniture. Oh, et mais Oui, feel free to buy something from our Etsy shops. Honest, we won't mind. I'm Piddlewick to our Pumpjack, a creative redhead with a smile. Our French finds and handmade items showcase my passions for the traditional, old-fashioned, but hopefully with a flair of a certain joie de vivre. This is Pumpjack to our Piddlewick, an eccentric, mad scientist on an Einstein scale, an Oenologist, otherwise known as a wine maker. His creative juices know no bounds, and are inspirational. Oh, and he's a dab hand at making things as well. To fulfil your order, you provide Pumpjack & Piddlewick with certain information (which you authorised Etsy to provide to us), such as your name, email address, postal address, payment information, and the details of the product that you’re ordering. You may also choose to provide us with additional personal information, such as for a gift, if you contact us directly. - Service providers. We engage certain trusted third parties to perform functions and provide services to our shop, such as postal and delivery companies. We will share your personal information with these third parties, but only to the extent necessary to perform these services. - Compliance with laws.We may collect, use, retain, and share your information if we have a good faith belief that it is reasonably necessary to: (a) respond to legal process or to government requests; (b) enforce our agreements, terms and policies; (c) prevent, investigate, and address fraud and other illegal activity, security, or technical issues; or (d) protect the rights, property, and safety of our customers, or others. - Change, restrict, delete. You may also have rights to change, restrict our use of, or delete your personal information. Absent exceptional circumstances (like where we am required to store data for legal reasons) we will generally delete your personal information upon request. - Object. You can object to (i) our processing of some of your information based on our legitimate interests and (ii) receiving marketing message (for a gift, in example)s from us after providing your express consent to receive them. In such cases, we will delete your personal information unless we have compelling and legitimate grounds to continue using that information or if it is needed for legal reasons. All our items are sent tracked, so you can monitor its progress. We do not offer Express or overnight delivery in general. What does Retro, Vintage and Antique mean? Vintage or Antique means not new / used / second hand / previously owned. Vintage is older than 20 years and less than 100 years old. Antique is over 100 years old, eg before 1919. Retro is a style statement, generally referring to the latter half of the 20th century. We do our best to describe each item accurately, including any imperfections. We use the pictures to try and show you all aspects of the item. Please do not hesitate to ask questions or request additional photos. If you order more than one item from us, sometimes the automatic calculation comes out too high. We always refund any shipping overcharges. If an item is over 3 cm / 1 inch it must go in a box. The Post Office cost to send a box is based on its weight. At Pumpjack & Piddlewick we do not make money off of shipping. We charge only what the Post Office charges us.